I have been wanting to see this musical ever since it first came to L.A. about 5 or so years ago while it was at the Pantages Theater. However, money and time being what they were - it was just never in the cards for me to see it! I was heartbroken but figured I'd get over it. Then......... late last year, I heard a commercial on the radio that it was coming back! And Sweet Pea wanted to see it too! (I know -she's 9. A lot of it was a bit "over her head". But she REALLY wanted to see it. Two weeks after my Sweet Pea celebrated 9 in style - we got "fancy" for a night out at the theater! She got her nails painted, hair curled and was allowed to wear 'lip gloss'. and then we made our way to the lovely Segerstrom Hall. It was the last weekend of the play so the house was packed! But we managed to make our way to our seats without stepping on too many toes and settled in for a wonderful show! By far and away one of the best musicals I have been to. And it lived up to all the hype and hoopla surrounding it. For those who aren't familiar - Wicked is the story of what happened before Dorothy arrived in Oz. 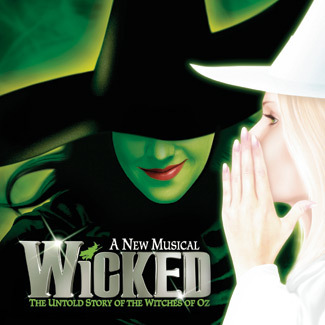 In short- the tale of Elphaba ( the Wicked Witch of the West) and how she came to be.......Wicked! I do love a good musical. It was a lovely evening and I can't think of a better way to spend a "birthday wish" with my kiddo. Sweets, Nana (my mother) & Me - just three ladies out for an evening of fun. The show began promptly at 7:30 and did not let out until about 10:50 , so you can imagine how "festive" Sweet Pea was feeling by then. She knocked out before we even left the city of Costa Mesa and by the time we pulled in our driveway she was folded-in-half sound asleep. Mary Poppins in July and West Side Story in September !! I L-O-V-E Westside Story - the movie- and can't even imagine the fun of it live!! And Mary Poppins would be just magical for the Sweets! Clearly we're about to turn into major theatre geeks and that's fine with me. Just don't judge when you hear me belting out 'Defying Gravity' slightly off-key.